Re-elected FSWCD supervisors Richard Davidson (left) and Jim Garland. FSWCD Chairman Fred Melvin (right) presents the Cooperator of the Year Award to Nathan (left) and Gordon Conn, representing Conn Farms. 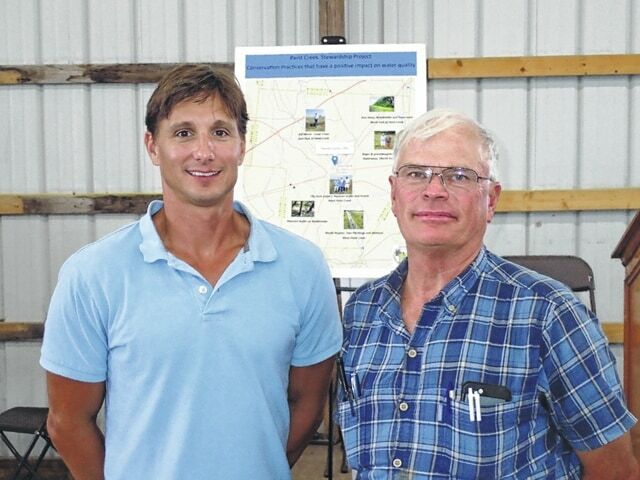 The Fayette Soil & Water Conservation District held its annual meeting and supervisor election at The Fayette County Demonstration Farm Tuesday. This event was held jointly with the Fayette County Farm Bureau. A public election took place to fill two seats as supervisor for a three-year term commencing on Jan. 1, 2017. The candidates were incumbents Richard Davidson and Jim Garland. The challenger was Jason Gentry. Residents and owners or renters of land in Fayette County had the opportunity to vote in this election since July 26. Representatives of the Ohio Soil and Water Conservation Commission were on hand to oversee the election. Davidson and Garland won re-election to the board. Bethany Reiterman was awarded a 2016 Fayette Soil & Water Conservation District Scholarship in the amount of $500. Three hundred dollar scholarships were given to Hannah Casto, Cody Clyburn, Alexis Schwartz, and Brock Wilt. All are graduates of Miami Trace High School. Bethany is attending Oklahoma State University with a major in agricultural education. Hannah is attending Morehead State University with a major in veterinary technology. Cody is attending Morehead State University with majors in biology and agronomy. Alexis is attending the University of Kentucky with a major in equine science. Brock is attending Illinois Central College with a major in agricultural education. 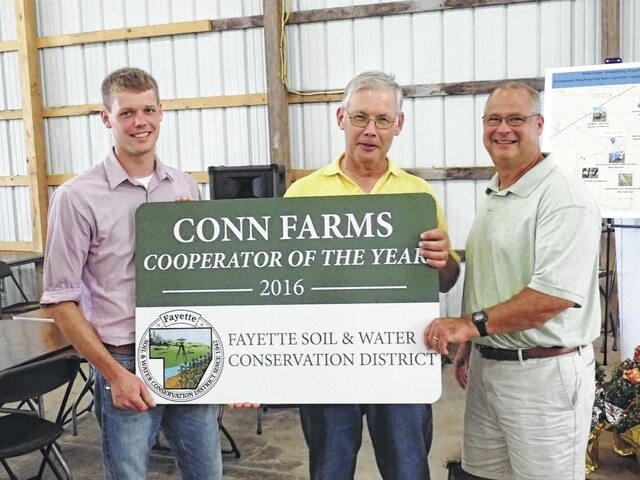 The “Cooperator of the Year” award was presented to Gordon and Nathan Conn of Conn Farms. Over the past few years, Conn Farms has installed numerous best management practices. These practices include grassed waterways, conservation cover, and over 190 acres of filter strips. Gordon Conn also served for 12 years as a supervisor of the district until he stepped down at the end of his term in 2014. Fayette SWCD Director Chet Murphy briefly spoke on a number of the programs that the district offers and thanked the agencies that partner with the district in order to make these programs possible. Murphy announced the new Ohio Pollinator Habitat Initiative. The Ohio Pollinator Habitat Initiative (OPHI) is seeking public involvement to collect and drop off common and swamp milkweed seed pods from established plants, Sept.1 through Oct. 30 at collection stations around the state. The seeds will be used to establish new plantings and create additional habitat for the Monarch butterfly throughout Ohio in the coming years. Fayette SWCD will be the collection station for Fayette County. For more information, call the Fayette SWCD office at 740-636-0279 or stop by their office in the Fayette Ag Center, 1415 US 22 Southwest, Suite 500, Washington Court House. Murphy closed by thanking all those individuals and groups who work with the district to protect and improve the natural resources of Fayette County. https://www.recordherald.com/wp-content/uploads/sites/27/2016/08/web1_Re-elected_Supervisors_Richard_Davidson_and_Jim_Garland.jpgRe-elected FSWCD supervisors Richard Davidson (left) and Jim Garland. https://www.recordherald.com/wp-content/uploads/sites/27/2016/08/web1_Nathan_and_Gordon_Conn_and_Chair-Fred_Melvin.jpgFSWCD Chairman Fred Melvin (right) presents the Cooperator of the Year Award to Nathan (left) and Gordon Conn, representing Conn Farms.